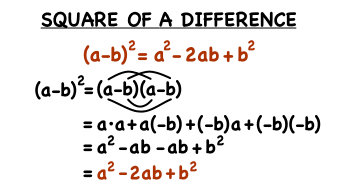 What's the Formula for the Square of a Difference? Comes in handy when you're factoring, and this tutorial will show you how to square like a pro! How Do You Multiply Binomials Using FOIL? Looking for practice using the FOIL method? This tutorial delivers! It takes you step-by-step through the FOIL method as you multiply together to binomials. The FOIL method. No, not aluminum foil! The FOIL method stands for First, Outer, Inner, and Last. It's a popular way multiply two binomials together. This tutorial makes the FOIL method a breeze! What's the Formula for the Square of a Sum?